Cut the courgette into thin slices lengthways, then cook in a grill pan for 2 minutes on each side. In a bowl, add the beef mince, grated parmesan, eggs, parsely and salt and mix together well. On a baking tray lined with baking paper, make a rectangle shape with the mince mix, then add a layer of grilled courgette on top, then a layer of sliced mozzarella. Using the baking paper, roll the mince up into a sausage, then bake in the oven at 180°C for 15 minutes. Unroll both sheets of pastry and make horizontal cuts 2cm wide across each sheet to give you strips of pastry. Peel alternative strips back in the opposite direction on one sheet, then add another strip from the second sheet perpendicular acroos the others, then fold the strips back over the top. Repeat this process to create a lattice. 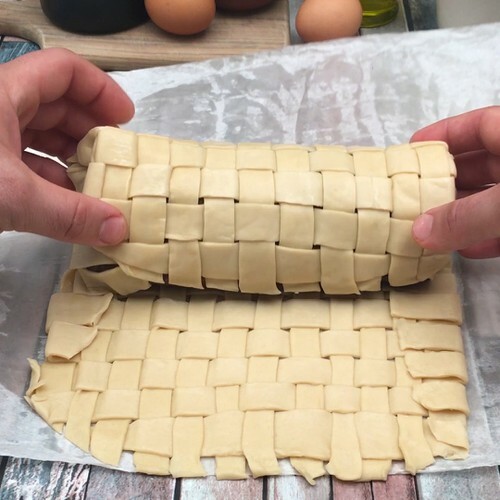 Place the cooked mince sausage on the pastry lattice, then fold the pastry over the meat and brush the pastry with an egg yolk. Bake in the oven on a baking tray for 15 minutes at 180°C, then enjoy.